Resonus Classics continue to mine the recorded legacy of the late John Scott from his tenure (2004-2015) as Organist and Director of Music at Saint Thomas Church, Fifth Avenue, New York. This latest programme is most interesting. I don’t believe I’ve encountered Herbert Howells’ beautiful a cappella Requiem paired on disc before with Maurice Duruflé’s much-loved setting of the Mass for the Dead. However, they complement each other very nicely, and all the more so with Vaughan Williams’ visionary Valiant-for-truth acting as a bridge between them. When the Howells work was finally released by the composer in 1980 it was widely held to be inextricably linked with the sudden death of his son, Michael in 1935. Dr Martin Ennis points out in his valuable booklet notes that though the work was clearly dated 1936 when it was first published there is now strong evidence that composition began some years before that, possibly as early as 1932. 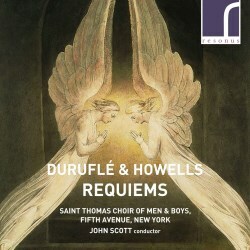 The link with Michael Howells’ death may not be quite as strong as was first thought, therefore, but it is scarcely surprising that the assumption was widely made, especially since Howells recycled quite a bit of music from the Requiem into his transcendent masterpiece, Hymnus Paradisi. Unlike the Duruflé score, Howells’ Requiem is not a setting of the Mass for the Dead. Instead Howells set a discerningly chosen collection of texts that are inextricably linked with the Departed. He followed pretty closely the scheme of the Short Requiem (1915) by Henry Walford Davies. This New York performance is a very fine one. Most recordings of the work that I know are by mixed adult choirs. Indeed, I only know two recordings by church choirs including trebles; these are both by the choir of St Johns College, Cambridge, one under George Guest (review) and one conducted by Christopher Robinson (Naxos 8.554659). So, if you want a recording of this piece by an all-male choir the choice isn’t extensive. That said, both of the St John’s recordings are good and this present one from New York is an equally strong contender. The fine quality of the singing is immediately apparent in the opening ‘Salvator mundi’, which receives a very fluent performance. The choir also distinguish themselves in ‘Requiem aeternam I’, which is one of the movements from which Howells borrowed for Hymnus Paradisi. This is very beautiful music and here it unfolds very naturally. We hear good tenor and baritone soloists in Psalm 121 – it’s a pity they’re not named. The concluding ‘I heard a voice from heaven’ – another source for Hymnus – is eloquent and poised. I admired this Howells performance very much. One feature of the choir’s singing that I like is that the edge which is natural to treble voices has been tamed somewhat, either by the acoustic or by John Scott’s training – or both – yet the edge hasn’t been lost and the result is very pleasing, as is the blend with the other three voice parts. That comment holds good for the whole programme. Valiant-for-truth is an astute choice, not least because it was composed in the years immediately between the other two works. It also feels right, coming between them. I’m not entirely sold on the sound of male altos in the opening phrases. I stress, however, that this observation reflects personal taste and is not a criticism of the New York singers’ delivery. It’s a fine piece and it comes off very well in this performance. Duruflé’s Requiem had surprising origins in a commission for a secular orchestral work but, happily, the composer took a different path and the glowing setting of the Mass for the Dead was the result. The work was first heard in a full orchestral version but I much prefer to hear it either in the version with chamber orchestra and organ or, as here, with just organ. (John Scott, like many conductors, wisely retains the crucial cello part in the ‘Pie Jesu’ even though he’s using the organ version.) The present performance benefits greatly from the excellent, sensitive contributions of Frederick Teardo, who was the Associate Organist at St Thomas at the time of this recording. In the Introit I like the very natural flow that John Scott imparts to the plainchant-suffused music; this will be a feature of the whole performance. In the ‘Christe’ section of the Kyrie the trebles do very well indeed and they lead in convincingly to urgent singing by the whole choir at the movement’s climax. The Offertorium gives us a chance to hear the baritone, Richard Lippold, at that time a member of the choir. His singing has presence and he sings with dignity and eloquence. He also does his shorter second solo, later in the work, well. Mezzo Kirsten Sollek makes a very good impression in the ‘Pie Jesu’. Her tone is lovely and warm and she sings with real feeling yet she controls both the emotion and her voice very well. Cellist Myron Lutzke offers fine support. In the concluding ‘In Paradisum’ the trebles don’t make – or aren’t allowed to make – the error of singing too ethereally; that might result in these young voices sounding frail. As it is, they sing with confidence and sensitivity and they let the building help them to sound ethereal. The result is that their sound has substance but it comes across as pure and innocent. This is a very well judged and sensitive account of Duruflé’s masterpiece; I liked it a lot. These very successful performances have been presented in very sympathetic sound by engineer John C Baker. He’s captured well the natural resonance of the building yet the choir is heard clearly and is very well balanced both internally and against the organ in the Duruflé. The documentation is very good. This is a very successful disc which, like the previous issues in this series that I’ve heard, makes the listener regret all the more the premature death of John Scott.